IGES created this collection of NASA Earth systems visualizations , organized by cross-cutting topics commonly found in middle and high school curricula (cause and effect; systems and system models; scale proportion and quantity; patterns, similarities, and differences; stability and change; energy and matter). Includes annotated and non-annotated versions for interpretation; links to sample K-12 lessons; and video interviews with NASA visualizer Kel Elkins and NASA GPM Mission Scientists. The content was originally on a DVD and is provided on this website. Learners use their prior knowledge, observations, and inferences to interpret this unlabeled image. The original DVD was included in this booklet, which includes examples of visualizations by topic, additional sources for NASA visualizations, and examples of classroom activities. 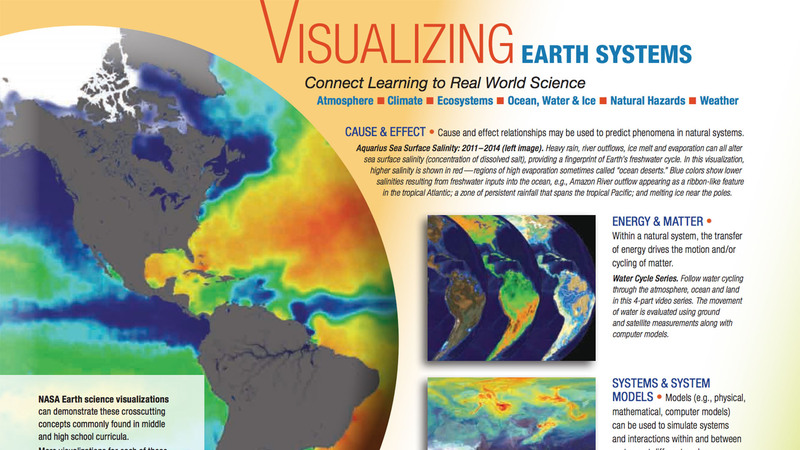 Accompanying the visualizations guide, NASA scientists and educators also contributed blog posts about their work with visualizations. This reading guide contains useful strategies for increasing comprehension, as well as a listing and categorization of the blog posts.